Last week, equities were supported by hopes for renewed trade talks between Washington and Beijing, although optimism was dampened towards the end of the week as the Trump administration is moving towards implementation of additional tariffs. Strong economic data in Developed Markets (DM) and a weaker US Dollar improved risk appetite as well. The latter contributed to a rebound in Emerging Markets (EM) assets as Turkey’s central bank lifted interest rates. Trade war, round 2: Tariffed! Last week, risk appetite was fuelled by China receiving an invitation for new trade talks from Washington. Nevertheless, optimism around new talks vanished quickly as the US this week announced 10% tariffs on an additional USD 200bn of Chinese goods. The macro backdrop behind this decision: The US’ trade deficit visa-vis China reaching new highs in July, so there are good reasons for Trump not backing down at this stage, especially as the US mid-term election is looming. In total, half of Chinese imports to the US are now “tariffed”, with Trump threatening to tax all imports from China if Beijing opts for retaliation. The trade war is currently living up to its name. At the same time, a 14-year high in US manufacturing confidence and US equities’ performance supremacy is an impressive demonstration of how immune the US economy and markets currently are to the trade tremors. So as long as Trump’s popularity among Republican voters stays strong, we do not expect trade headwinds to fade meaningfully. Globalisation and a rising China contributed to American workers receiving a smaller share of the economic pie (LHS chart). Consequently, dampening China’s rise in the global economy should also contribute to Trumps popularity domestically. 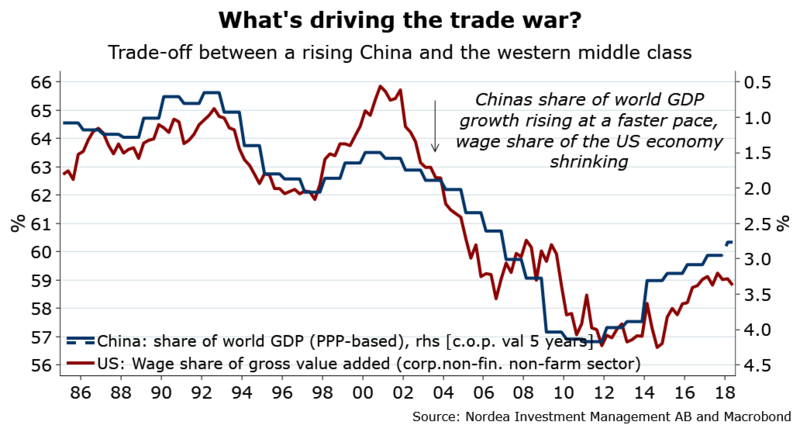 From a “Trumplateral” perspective, the risks to the US’ grand strategy on trade and China therefore seem manageable, the upside considerable. Despite the US being so far largely immune to the trade tremors, trade remains the biggest “known unknown” for markets in 2018, as the rest of the world is all but immune. While the muted short-term market reaction to additional tariffs on USD 200bn of Chinese goods suggests a lot is already priced, additional tariffs are more likely than not over the coming months (see above). The trade war therefore will continue to put a lid on risk appetite, favouring US equities over regions with high “betas” to global trade. The US Dollar should strengthen further as capital is flowing from these high-beta regions back into the US. Defensive asset classes like core fixed income should be increasingly sought after. As a trade war might be inflationary in the short term, but deflationary in the medium- to long term, we expect the US yield curve to flatten further, putting the Fed and markets on heightened “inversion alert”. Trade war: Cause and effect. 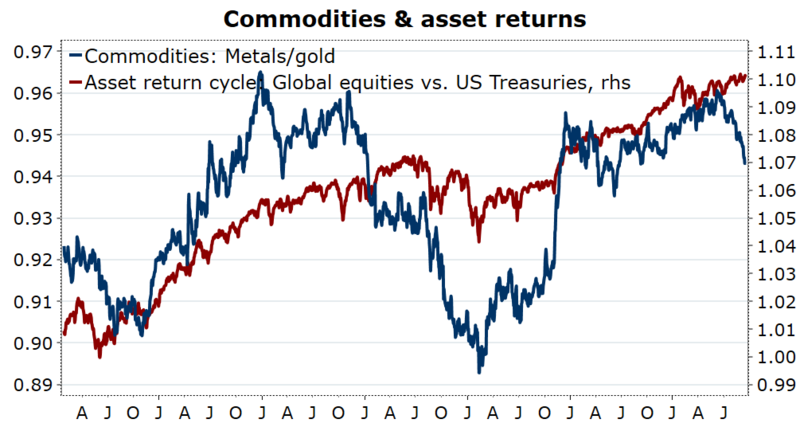 Macro snapshot: A little bit of (US) goldilocks repeating? Leaving trade news aside, last week’s improved risk appetite was fuelled by goldilocks-like data flow in the US. On top of US manufacturing confidence reaching a 14-year high in August, US consumer confidence is now at the second highest since 2004. At the same time, both US core inflation as well as producer prices surprised to the downside last week. Looking towards EM, however, things look more sober. 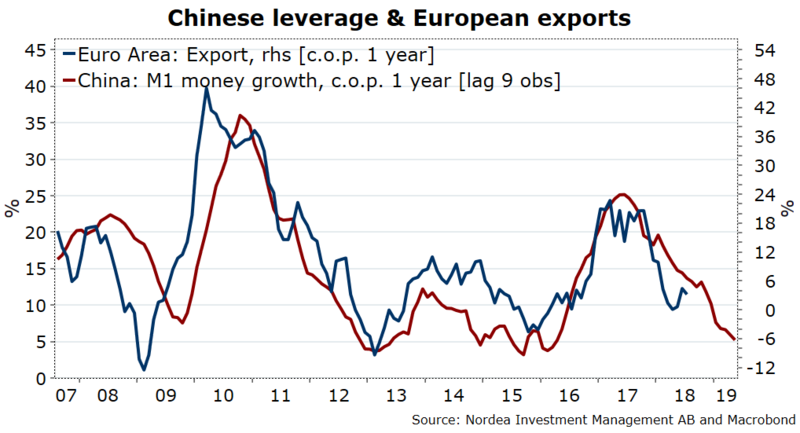 Our favourite indicator, Chinese money growth, is hinting at further growth deceleration, which also is affecting the outside world, Europe in particular (LHS chart). Two key points are worth noting based on last week’s macro agenda: First, the goldilocks data mix from the US (strong growth/weaker inflation) might be a relief for EM assets in the short term, as it reduces monetary tightening pressure from Washington at the margin. But one month’s observations do not make a trend. A Sept. rate hike from the Fed is pretty much a done deal and it will take more to make the Fed drop hiking come December. Recent Fed speeches had a hawkish tilt, which might have contributed to the 10Y US government bond yield again testing the 3% threshold. All in all, soft US inflation data is no panacea for battered EM assets, despite short term relief. Secondly, economic activity indicators still point towards a strong US, weak China and Europe in no man’s land between these two main poles. For those investor’s not willing to make short term bets, overweighting Developed Market assets should remain the preferred allocation. Reducing downside risks via assets with low correlations relative to the overall market such as liquid alternatives (RHS chart) remains attractive amid rising macro risks. Nordea Asset Management (NAM, AuM 213.4 bn EUR*), is part of the Nordea Group, the largest financial services group in Northern Europe (AuM 307 bn EUR*). NAM offers European and global investors’ exposure to a broad set of investment funds. We serve a wide range of clients and distributors which include banks, asset managers, independent financial advisors and insurance companies. Nordea Asset Management has a presence in Cologne, Copenhagen, Frankfurt, Helsinki, London, Luxembourg, Madrid, Milan, New York, Oslo, Paris, Sao Paulo, Singapore, Stockholm, Vienna and Zurich. Nordea’s local presence goes hand in hand with the objective of being accessible and offering the best service to clients. Nordea Asset Management is the functional name of the asset management business conducted by the legal entities Nordea Investment Funds S.A. and Nordea Investment Management AB (“the Legal Entities”) and their branches, subsidiaries and representative offices. This document is intended to provide the reader with information on Nordea’s specific capabilities. This document (or any views or opinions expressed in this document) does not amount to an investment advice nor does it constitute a recommendation to invest in any financial product, investment structure or instrument, to enter into or unwind any transaction or to participate in any particular trading strategy. This document is not an offer to buy or sell, or a solicitation of an offer to buy or sell any security or instruments or to participate to any such trading strategy. Any such offering may be made only by an Offering Memorandum, or any similar contractual arrangement. Consequently, the information contained herein will be superseded in its entirety by such Offering Memorandum or contractual arrangement in its final form. Any investment decision should therefore only be based on the final legal documentation, without limitation and if applicable, Offering Memorandum, contractual arrangement, any relevant prospectus and the latest key investor information document (where applicable) relating to the investment. The appropriateness of an investment or strategy will depend on an investor’s full circumstances and objectives. Nordea Investment Management recommends that investors independently evaluate particular investments and strategies as well as encourages investors to seek the advice of independent financial advisors when deemed relevant by the investor. Any products, securities, instruments or strategies discussed in this document may not be suitable for all investors. This document contains information which has been taken from a number of sources. While the information herein is considered to be correct, no representation or warranty can be given on the ultimate accuracy or completeness of such information and investors may use further sources to form a well-informed investment decision. Prospective investors or counterparties should discuss with their professional tax, legal, accounting and other adviser(s) with regards to the potential effect of any investment that they may enter into, including the possible risks and benefits of such investment. Prospective investors or counterparties should also fully understand the potential investment and ascertain that they have made an independent assessment of the appropriateness of such potential investment, based solely on their own intentions and ambitions. Investments in derivative and foreign exchange related transactions may be subject to significant fluctuations which may affect the value of an investment. Investments in Emerging Markets involve a higher element of risk. The value of the investment can greatly fluctuate and cannot be ensured. Investments in equity and debt instruments issued by banks could bear the risk of being subject to the bail-in mechanism (meaning that equity and debt instruments could be written down in order to ensure that most unsecured creditors of an institution bear appropriate losses) as foreseen in EU Directive 2014/59/EU. Nordea Asset Management has decided to bear the cost for research, i.e. such cost is covered by existing fee arrangements (Management-/Administration-Fee). Published and created by the Legal Entities adherent to Nordea Asset Management. The Legal Entities are licensed and supervised by the Financial Supervisory Authority in Sweden and Luxembourg respectively. The Legal Entities’ branches, subsidiaries and representative offices are licensed as well as regulated by their local financial supervisory authority in their respective country of domiciliation. Source (unless otherwise stated): Nordea Investment Fund, S.A. Unless otherwise stated, all views expressed are those of the Legal Entities adherent to Nordea Asset Management and any of the Legal Entities’ branches, subsidiaries and representative offices. This document may not be reproduced or circulated without prior permission. Reference to companies or other investments mentioned within this document should not be construed as a recommendation to the investor to buy or sell the same, but is included for the purpose of illustration. The level of tax benefits and liabilities will depend on individual circumstances and may be subject to change in the future. © The Legal Entities adherent to Nordea Asset Management and any of the Legal Entities’ branches, subsidiaries and/or representative offices.